Tullynally castle is a great gothic revival castle, with a maze of fairytale towers and turrets piercing the skyline. The Pakenhams have lived there for over 350 years and it is very much a family home. Note the conservatory on the east wing, a touch of suburbia? Well not quite, this ‘home’ has some 120 rooms, but there are lots of childrens toys lying around which hints at the 'ordinary' family life this huge castle has witnessed down through the years. And like any family it has had its share of eccentric characters, war heroes, turned clerics, great explorers, philanthropists and patrons of the arts. They often hold musical evenings with chamber quartets and piano recitals, I am told the acoustics in the great hall are perfect! Access to the castle is limited and by appointment for obvious reasons, but it is a treasure trove and well worthwhile visiting if you get the opportunity. The gardens, however are open all through the summer, and are quite magical and other worldly as they always have been. I used to visit when my children were young, back then you simply left a donation in the box provided and let yourself in. More often than not, we saw no-one and no-one bothered us. Thankfully it is still as quiet and peaceful. The walled garden smacks of lazy Victorian summer afternoons spent idling on the lawns or gathering cut flowers and fresh vegetables for the house from the kitchen garden. Various generations have added their stamp to the gardens, they now boast Tibetan and Himalayan styled gardens complete with temples and pagodas for you to sit and meditate in, it could be called the Tao of Tullynally Castle. 1 Loughcrew Gardens and Adventure Park, entrance is in log cabin, which is also a nice tearooms and gift-shop where you can also pick up the key for the following with a deposit. 2 Loughcrew complex of burial mounds, passage graves, solar and lunar allignements. Great legend of Hag witch jumping from one to the other. 3 Fore Abbey was founded by St Feichan, note the lintel on the church, estimated to weigh 7 tons, which is believed to have been raised into place by the saints' prayers. 4 Ballinlough Castle, the walled gardens are open to the public and they hold a fantastic Body & Soul festival here in the grounds of the castle overlooking the lake every June. 5 Sheridans Cheesemongers, Carnaross, Virginia. Artisan cheese and wine shop in lovely old renovated railway station, perfect for al-fresco picnics at any of the following. 7 Stay at Lough Bawn House a delightful Irish Georgian country house with wonderful home cooking, log fires or cool drinks in the garden, touring packages available. 8 Or head back to Caffrey's in Oldcastle, my favourite pub lunch in the country, finest roast lamb and fresh country veg for under €10, including tea or coffee. 9 Mullaghmeen Forest, is the largest planted beech forest in Europe, a delight in spring carpeted in bluebells or for Autumn colour. 10 Lough Derrevaragh, is where the fabled children of Lir where banished too for 100 years by their evil stepmother. Next little immaculately kept village is where Michael O'Leary chief of Ryanair lives. 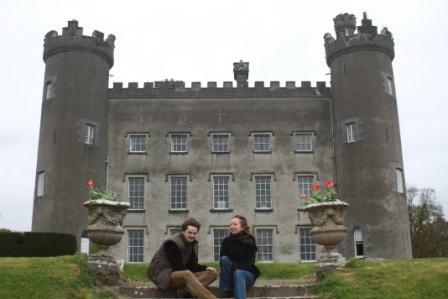 For more information on Tullynally Castle please click here.